Once up a time King Taksin freed Thailand from Myanmar for the second time during the Ayutthaya Kingdom in the 15th century. He was looking for a new location to make a new capital of Siam. He found a location for a new capital in Thonburi for about 15 years, then King Rama 1 just realize the palace was on the wrong site of the Chaopraya River, so he moved the palace to the Bangkok site. Today the Grand Palace was set to be the icon of Bangkok from 1782 till now. Before you get in there. Most days the Grand Palace will open every day. Do not believe any tuk tuk driver, or anybody that trys to tell you that “Oh today the Palace is closed” then they try to take you to the Gems factory or shopping for happy lucky Buddha, as I can tell from my 10 years experience as tour guide. I still can see this for every single time when I go there, so just walk inside the main entrance and buy the ticket at the ticket office. The other thing, if you wear a singlet, shorts, broken jeans or tight pants which look comfortable and trendy for a hot city like Bangkok, they will not allow you to get in with those things. The best choice you should have a sarong (long skirt or a piece of fabric) to cover your legs or shudder before your get in or the other choice. They will have the costume for you to borrow. That you have to leave the deposit 200 baths per piece (you can get money back after you return). Please note there is a very long cue to borrow it, so better bring it yourself. 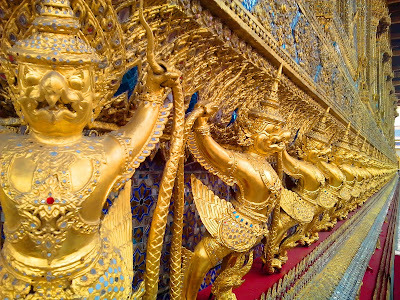 By the old day, The Grand palace is just like the other palace in Thailand. It is divided by 3 zones by this day, it has only 2 zone left. 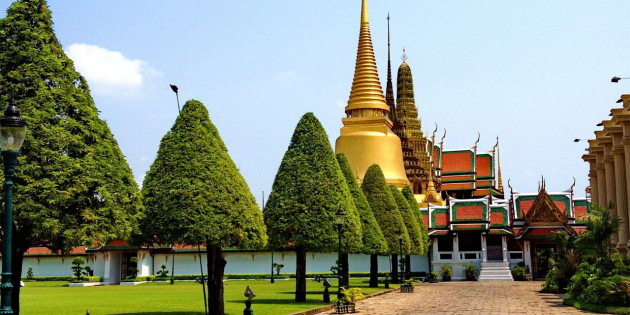 The outer zone contains the Emerald Buddha Temple. It is for the King to make ceremonies. In this temple you can see very beautiful hand paintings and a massive golden Pagoda. The main feature is the Emerald Buddha image. This Buddha is not actually made from Emerald but from one big piece of Jade, 66 cm wide and 44 cm high. The King or Prince will come here 3 times a year to change the Emerald costume when the seasons change. The center zones have 3 throne halls and the officer building. You can enjoy Thai architecture and art. You can also walk in and out of some of these halls at your leisure. Then next station! You might need to see the temple of Dawn and Wat Pho. It’s just walking distance from there. Like me to guide you through Bangkok and the Grand Palance? Then please contact me.